This work deals with the modeling, control and experimental validation of a flywheel test bench which is part of IREC's lab-scale microgrid. The storage device has been designed as a proof of concept. It is based on a low-speed rotating disk mechanically coupled to a Permanent Magnet Synchronous Machine. The electrical power is exchanged with the external grid by means of a set of back-to-back power converters. These power electronics control the speed of the machine, and thus the active power absorbed or injected by the device, and also regulate the reactive power at the point of common coupling with the external grid. Vector control techniques are used for designing the converter controllers: a field oriented vector control algorithm is implemented for governing the servomotor while the instantaneous power theory-based algorithm is used to manage the active and reactive currents flowing from the grid side converter. The control implementation in the experimental setup has been carried out by means of programming Digital Signal Processors (DSP's). The modeling and control system design has been validated after executing several experiments. This work deals with the modeling, control and experimental validation of a flywheel test bench which is part of IREC’s lab-scale microgrid. The storage device has been designed as a proof of concept. It is based on a low-speed rotating disk mechanically coupled to a Permanent Magnet Synchronous Machine. The electrical power is exchanged with the external grid by means of a set of back-to-back power converters. These power electronics control the speed of the machine, and thus the active power absorbed or injected by the device, and also regulate the reactive power at the point of common coupling with the external grid. Vector control techniques are used for designing the converter controllers: a field oriented vector control algorithm is implemented for governing the servomotor while the instantaneous power theory-based algorithm is used to manage the active and reactive currents flowing from the grid side converter. The control implementation in the experimental setup has been carried out by means of programming Digital Signal Processors (DSP’s). The modeling and control system design has been validated after executing several experiments. Diaz-Gonzalez, F. [et al.]. 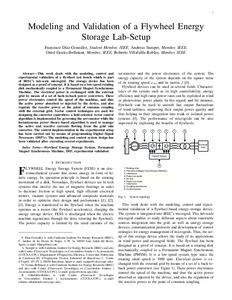 Modeling and validation of a flywheel energy storage lab-setup. A: IEEE PES Innovative Smart Grid Technologies. "2012 3rd IEEE PES Innovative Smart Grid Technologies Europe (ISGT Europe), Berlin". Berlin: 2012, p. 1-6.